Shares in British lenders fell after government resignations increased the chances of Britain failing to agree a deal with the EU. Investors are pushing back hopes for higher interest rates. That leaves banks stuck with low margins on top of political and economic uncertainty. Two cabinet ministers have quit, weakening Prime Minister Theresa May and reducing the already-slim chances that parliament will support her deal to leave the European Union. That makes the alternatives of a painful and chaotic Brexit, or a second referendum, more likely. Prime Minister Theresa May’s draft deal would bind the UK to the EU without the benefits of membership. Even if her cabinet backs it, parliament may not. Opponents have two options: crash out of the bloc next March, or call another referendum. The fight will only get more bitter. The EBA’s adverse scenario hits Barclays and Lloyds worse than other euro zone lenders. A projected UK economic hit deeper than euro zone peers helps explain why. EU stress tests are always political, and this one can be read as a coded warning against a messy UK exit. Britain may be close to securing a deal that would give London basic access to EU financial markets. That’s boosted sterling but offers limited cheer to banks. Such an accord would fail to cover many banking services and force an alignment with rules over which the UK has no say. The telecom company’s success at tempting clients to buy pricier connections is lifting revenue and profitability. The strategy may unravel and its pension deficit widen if Britain exits the EU without a deal. Incoming CEO Philip Jansen would then have to cut more costs quickly. Finance minister Philip Hammond plans to control the deficit while spending more on health, defence and schools without big tax hikes. Economic serendipity allows him to. A messy EU exit would end a run of good fortune, since he has used up much of the windfall that came his way. The state-owned UK lender’s 100 mln pound provision to cover the risk of a messy UK exit from the EU is trifling given its loan-book size. Yet private UK banks have taken the same step less noisily. A decade after it was rescued, RBS still wears its public embrace uncomfortably. The UK bank may buy back 2 billion pounds-worth of stock next year, according to the Financial Times. That could boost annual returns to nearly 15 percent and justify as much as a 40 pct boost to Lloyds' share price – as long as the UK can avoid a messy split from Europe. With five months to go, Prime Minister Theresa May still can’t come up with a plan that satisfies the European Union and hard-line parliamentarians. To avoid a chaotic Brexit, at least one side must cave. That won’t happen until the disastrous alternative gets even closer. The Anglo-Dutch group ditched a vote to move its head office to the Netherlands after UK shareholders rebelled. The saga shows the limits of the special treatment that large multinationals can ask from politicians. It also demonstrates what investors can do when they join forces. Companies are rushing to list while stock-market valuations are rich and before Britain crashes out of the EU. The deluge means bankers have to price offerings modestly, and investors can afford to be picky. Hairier issuers, like Aston Martin or Funding Circle, face a bumpy ride. The European Medicines Agency is embroiled in a legal fight to scrap a lease on its UK headquarters. Its argument, that Brexit was an unforeseeable event, looks weak. But even if the regulator loses the case, its actions offer a grim prognosis for London office property. In the first of our “Ten Years After” series, Peter Thal Larsen talks to Adam Tooze. The Columbia University history professor joins the dots from the 2008 crash to Brexit and U.S. elections, noting a declining faith in U.S. willingness to be the global lender of last resort. 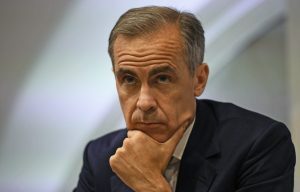 The Bank of England boss may extend his term for a second time, keeping him at the central bank beyond June 2019. That could offer comfort to investors worried about Brexit. But it would suggest the government is struggling to find a good successor. That’s a bad signal to send. Planning for “no deal” should embarrass serious supporters of Britain’s departure from the European Union. An abrupt break will cut thousands of crucial ties and create chaos. The pro-Brexit crew could have learned from the EU’s history of backing high deals with dull details. Prime Minister Theresa May hopes deeper ties with the continent will help cushion the blow of leaving the EU. But UK trade with sub-Saharan Africa is less than 3 pct of what it exchanges with Europe. With Nigeria and South Africa in the doldrums, prospects for growth look slim. Britain’s contingency plans for leaving the European Union without an exit deal distil the economic risks of red tape, border delays, and financial disruption. While the scenarios aren’t novel, they underscore the extent to which the UK is relying on Brussels’ good will.